The Autumn/winter 2015 make-up collection has arrived at HABITUDE. 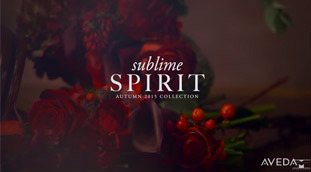 Inspired by strong women of the past and present, the autumn 2015 Sublime Spirit collection pushes boundaries and puts a modern spin on iconic looks. Use the collectionâ€™s ornate, shimmering golds and sandy bronzes to accentuate eyes and deep, glossy and natural lip colors to create one of theÂ three lip trends weâ€™re seeing this season. The collection is your paletteâ€“paint your masterpiece. Gold isÂ a huge makeup color trend this season and not for eyes. Reach for an Aveda gold staple-Petal Essence Single Eye Color in Illumination-and use it to highlight the temples, bridge of the nose, cheekbones, chin and cupidâ€™s bow. 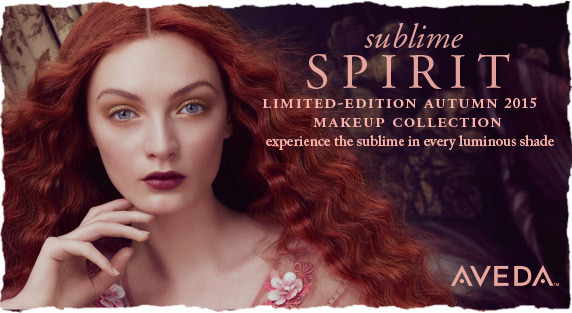 Whether you prefer your lips to be bold and beautiful, neutral and natural or somewhere in between, the autumn 2015 Sublime Spirit Makeup Collection can help you achieve all three in two simple steps. The common thread among all of them is to diffuse the color. Lips this season are stained and imperfect. Enjoy the behind the scenes video of these amazing masterpieces.